Since his younger days the sculptor and artist Otto Potsch collected everything, which belonged to his profession. 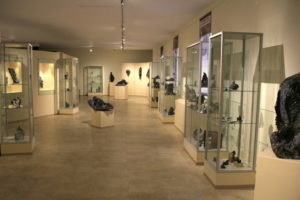 The idea of an exhibition, where he wanted to present visitors his knowledge and collections, grew gradually. The Felsenmuseum was built in between 1976 and 1980 with a lot of idealism and effort, with much help from his family. 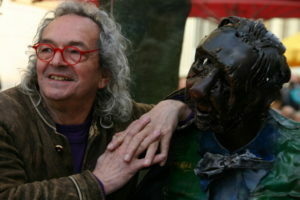 A special exhibition is dedicated to the sculptor Otto Potsch. There you can see a variety of his creations and highlights of his artistic career. Otto Potsch was born on the 20th of September 1938 in Vienna and he is the only expert in the field of editing Edelserpentin and amber in Austria. He completed his time of training at a distinguished ivory and amber-sculptor in Vienna. There he discovered his unique skills and his fondness for details. When he was 21 years old, Otto Potsch took his examination of the master craftsman’s certificate and in 1966 he opened the first art-workshop. This was the time when he started to work with Edelserpentin and he was especially fond of creating animal sculptures. You will see a movie, which shows the procedure of mining and editing Edelserpentin and Otto Potsch is creating a horse-sculpture. Otto Potsch is the first European, who created at the age of 19 years a “Chinese Miracle globe”, which is made from ivory. This accomplishment led him to uncover the ancient and guarded secret of Asian Ivory sculptors. He is the only one, who also created one from Edelserpentin. Otto Potsch is not only working with Edelserpentin and amber, but also with painting and music. Years ago he also began to collect scrap-metal. He started to shape sculptures, after editing it with the blowpipe and other forge-implement. Otto Potsch created famous figures like the Hawelka-monument in Mistelbach, Don Quijote, the 7 ravens, street musicians, clowns and much more.